Registration policies and information Cancellation policy No refunds on cancellations received seven (7) days or less prior to the course. Registration fees for cancellations received seven days or less prior to the course are nonrefundable and will be placed on account to use for a future course during the same fiscal year (May 1-April 30). No refunds for cancellation of the substituted course. Cancellations or transfers received within seven days of the event may be subject to a fee since meal guarantees have been made. You may substitute another individual for your registration. The substitute is subject to the member/nonmember registration fee policy. Please notify ISCPA of substitutions. No refund or transfer is available once eMaterials have been downloaded. schedules vary. Check the course information in the CPE catalog or on your confirmation. Registration opens 30 minutes before the course begins. Course materials ISCPA CPE course manuals are now paperless. No printed copies will be distributed onsite. eMaterials will be available to download 5-7 days prior to the course in the My CPE Tracker section of the ISCPA website. eMaterials may be saved to your electronic device or printed. Visit www.iacpa.org/paperless to learn more about this new approach. No refund or transfer is available once eMaterials have been downloaded. Special needs If you have medically necessary/dietary or ADA needs, please contact ISCPA at least one week prior to the course. Inclement weather policy Courses will be held as long as the facility is open and the instructor is present. When a course is canceled due to inclement weather, ISCPA will make every effort to contact registrants immediately. Please keep your emergency/cell phone contact information current. If a course is canceled, you will receive a full refund. In the instance of inclement weather, ISCPA will post a message on www.iacpa.org and on the individual course listing in the online CPE catalog, in addition to contacting participants directly. If you are unable to attend due to inclement weather and the course has not been canceled, you must notify ISCPA the day of the course. You will be issued a credit, minus a cancellation fee, that may be used for another ISCPA sponsored course within one year of the original course date. day. ISCPA courses are designed to qualify for CPE credit under the Iowa Accountancy Examining Board rules. Some courses may also qualify for Iowa Insurance CE, Iowa Continuing Legal Education, IRS, CFP and other specialty designations. Check the individual course listing for additional information on designations. 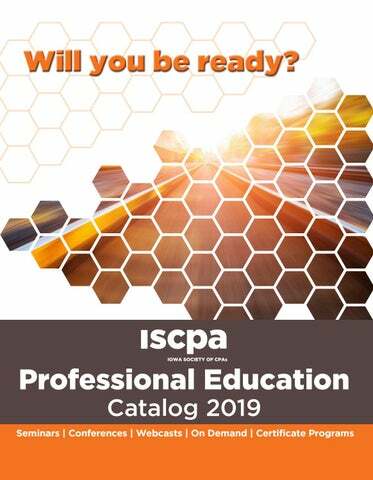 Contact ISCPA at 800-659-6375 or 515-2238161 if you wish to obtain continuing education credit for a course not already approved for the specialty credit you desire. Advance notice is required and in some cases require as much as 45 days notice. Track your CPE credits online My CPE Tracker is an ISCPA member-only benefit. ISCPA sponsored courses will automatically be posted to the online transcript as soon as possible after the course is held. Members may add non ISCPA courses to My CPE Tracker at any time. The online transcript can be printed or emailed for easy record keeping. Nonmember attendees at ISCPA courses will receive a transcript via mail or email at the end of the month a course was attended. Cell phones and electronic devices We love our devices too, but please silence yours during CPE courses. Disclaimer Printed materials and oral presentations of speakers at programs sponsored by ISCPA are not intended to be definitive analyses of the subjects covered. Seminar attendees and users of accompanying course materials are hereby cautioned that neither the program presenters nor the ISCPA intends that reliance be placed upon these presentations or materials in making professional judgments, business decisions, or rendering advice without confirming and updating information obtained with independent research. Onsite coordinator information EARN while YOU learn! Be an onsite coordinator Earn cash or save on your CPE. 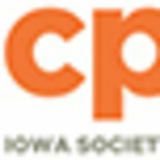 The ISCPA CPE Department is looking for members to serve as onsite coordinators at select ISCPA courses outside of the Des Moines area (except Sioux Falls, S.D.). Duties: •	Greet participants. •	Inspect and make arrangements for any necessary classroom changes. •	Confirm break and lunch schedule with facility staff. •	Distribute and collect evaluation forms, attendance sheets and other materials at event. •	Return evaluations, attendance sheets and extra materials to ISCPA. •	You will receive detailed instructions of your duties prior to the event. It’s easy! Onsite coordinators will receive a registration discount or direct compensation of $125 per day per eight hour course and $60 per four hour course. The discount may be taken off the course fee upon registration or the coordinator can be directly compensated after the course has taken place and duties have been fulfilled. To be an onsite coordinator visit www.iacpa.org/cpe/onsite-coordinator or complete and return the form below. Check the online CPE catalog frequently for course additions, changes and information for in-person training, webIndicates a live webcast is available in addition to in-person attendance. casts, on demand and certificate programs. Sponsor and exhibit Make a lasting impression on business prospects with face-to-face interaction and opportunities to talk about your services and solutions at ISCPA conferences and events. Another great benefit of ISCPA membership. Why the new approach? •	It is important to have the most current information. The file made available 5-7 business days prior to the course will be the most current information. •	Paperless eliminates the need to store or collect bulky manuals on your desk or in your office. •	Instead of flipping through multiple printed pages to find a definition, act or rule, you can easily search for a keyword or phrase for immediate results. •	Going paperless is environmentally friendly. FAQs 5. How can I annotate (electronic note taking)? You can annotate in your eMaterials using Adobe Acrobat 7.0 or higher, or by using free PDF annotation software. Visit www.iacpa.org/paperless to learn more. 1. What if I want a printed copy of the manual? If you would like a printed copy, download the electronic manual (eMaterials) from the My CPE Tracker section of the ISCPA website and print it prior to the course. Printed manuals will no longer be distributed onsite. 6. Can I share my eMaterials with others? All eMaterials are copyrighted and permissions to download or print is granted exclusively to the paid attendee. 2. When can I download my eMaterials? eMaterials are available to download 5-7 business days prior to the course. You will receive an email alerting you when they are available for download. 7. What if I need to cancel my registration? No refund or transfer is available once eMaterials have been downloaded. Visit www.iacpa.org/cpe/ policies for more information. 3. How can I view the downloaded eMaterials? eMaterials can be viewed on your laptop, tablet or favorite electronic device. Or, you can print them prior to the course and bring them with you. Electrical access will be available to charge your device at the course location. It is recommended to have your device fully charged prior to arriving. 4. How will eMaterials be formatted? eMaterials are provided in a PDF. We recommend having Adobe Reader or Adobe Acrobat, version 7.0 or higher. 8. Have questions? We are here to help. Contact us at 800-659-6375, 515-223-8161 or iacpa@iacpa.org. CPE course manuals are now paperless. No printed copies will be distributed onsite. See side panel for more info. â&#x20AC;&#x2030;Fill out the form completely. All registrations must be accompanied by the total payment. Please make checks payable and return to: ISCPA 1415 28th St Ste 450 West Des Moines, IA 50266 Questions: Phone 515-223-8161 In Iowa 800-659-6375 Email: iacpa@iacpa.org Website: www.iacpa.org Note: If you do not receive your confirmation within three days of registering, contact ISCPA to confirm that your registration was received. Special services: If you have medically necessary/dietary needs, please contact ISCPA at least one week prior to the program. printed copies will be distributed onsite. See side panel for more info. *Course materials: ISCPA CPE course manuals are now paperless. No printed copies will be distributed onsite. eMaterials will be available to download 5-7 days prior to the course in the My CPE Tracker section of the ISCPA website. eMaterials may be saved to your electronic device or printed. Cancellation, refund and transfer policy: No refunds for p ISCPA member p Other state CPA society member (indicate state)________________ cancellations within seven calendar days p AICPA member #_________________________________________ p Nonmember of the course. A fee Special services: If you have medically necessary/dietary needs, please contact ISCPA at may apply for transfers seven days or less prior least one week prior to the program. to the course. No refund Cell phone number (for course cancellation due to weather, etc. ):________________________ or transfer is available once eMaterials have been downloaded. Online learning from ISCPA Enjoy the convenience from work, home or on the road! 20 more choices in 2019! ISCPA LIVE WEBCAST PROGRAMS Experience ISCPA live programs in real time from the comfort of your home or office. View and listen as part of the audience and even take part in Q&A with the instructor! This symbol indicates a live webcast is available in addition to in-person attendance. Sign up to attend at www.iacpa.org/events. Check back for more dates in a town near you!